The last five years have seen one of the most notable and striking changes to Seattle's underground, electronic, neoclassical and experimental music landscape. With the end of the summer 2015 came the final Northwest edition of Rafael Anton Irisarri's Substrata Festival, and in an open letter Decibel Festival's 13th year closed with programming director Sean Horton's farewell to the city. It should be noted that Horton has since announced the revival of the Decibel in 2018 in a Los Angeles iteration, with proposed Seattle satellite mini-festival to follow. In the two years following the closing of these expansive international forums, Seattle's monthly showcases of electronic and experimental sounds, Elevator, Secondnature, MOTOR, Patchwerks, False Prophet and Wayward Music Series have endeavored to fill the void, produced a string of memorable one-off events. Most notably, Elevator stepping up their programming for their Machine House Brewery location as well as showcases held at Kremwerk and Columbia City Theater, with curation that embraced a spectrum spanning the deep experimental underground to the sharpest of cutting edge urban sounds. Their vision represented by the diversity found in the intersection of the UK bass and club sounds of Gaika and Yves Tumor, to Julia Holter's lush interplay of jazz orchestrations, dissonant guitar and open-ended songform alongside the soaring vocalizations of Haley Fohr's Circuit Des Yeux. More experimental sounds were heard in the audio-visual tapestries of experimental filmmaker, Paul Clipson and Liz Harris' Grouper project at Northwest Film Forum, and the immersion and electronic concrete of Lawrence English with Rafael Anton Irisarri. Closing with the most striking performance in their programming history, the final of their seasonal showcases saw the collision of industrial surrealism and the dancefloor propulsion represented by the Modern Love label's Demdike Stare. Elevator's maturation in 2016 came with their expansion into exhibition and performance programming with the inauguration of Corridor Festival. Hailed as a unmitigated success in local press, it's daylong meeting of audio-visual media, installation art, music and performance fast became the city's best new festival for cutting edge sounds. Next week sees the arrival of the festival's third installment with an equally pan-media lineup held at the West Coast Printing building in the Central District. Their gamble on a daylong multimedia event in the heart of the industrial district, with a "New Georgetown Arts Festival Will 'Embrace Winter, Welcome Darkness, and Enjoy the Indoors'", filled a notable seasonal arts gap. 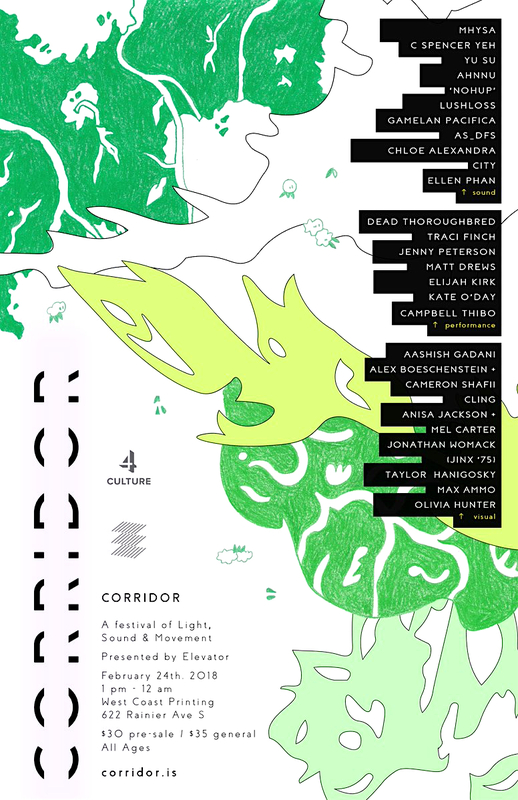 Returning "After a Great Debut, Corridor Fest Brings Another Multimedia Spectacular to Georgetown" the following year with an equally successful event in which, "The Organizers of Corridor Festival Invite the City to Be Alone Together".